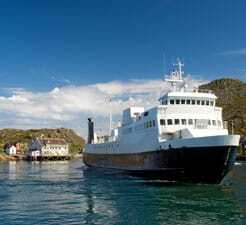 At directferries.co.uk you can plan, compare and book your ferry to Norway sailing to the port of Kristiansand quickly, easily and securely online. Using our fare search you can check timetables, live prices and availability for Ferries to Kristiansand, or compare your destination with alternative ports, not just in Norway, but further afield too. Getting a price or making a booking couldn't be easier. All you need to do is select your preferred Kristiansand route from the menus, number of passengers and hit search. If you are looking for a Kristiansand Ferry departure, please visit our Kristiansand Ferry page. Hi nice comfortable ship. Best to book a voyager seat or maybe business class. Good breakfast. Dog was happy in the car. "Trip to Norway to collect our new puppy." Travelled with " Color Line " last week from Hirtshals to Kristiansands and again on our return journey, on the return trip we had a puppy with us so were worried about leaving him in the car alone for over 3 hours.... Color Line were fantastic and made sure a crew member was available every hour to take us down to the car-deck to check our puppy, this was hugely reassuring for us and made the crossing stress free. The boat was very clean and comfortable to travel on with plenty of seating to enjoy the crossing, restaurants served good quality food and were not overpriced, plenty of duty free shopping to help pass the time and buy some lovely gifts. A very enjoyable experience on board Color Line and we would definitely recommend using this ferry service. Purchased ferry ticket on line through Direct Ferries. Process was smooth with confirmation from the carrier. Printed confirmation and brought it with me. no questions, no hassels. Very easy process. Ferry was a little late due to weather conditions, but that did not matter to me.